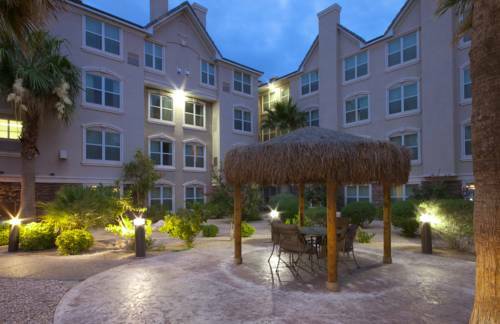 The newly renovated Residence Inn Las Vegas is the premier choice for extended stay hotels near Las Vegas airport. One block away from the famous Las Vegas Strip & half-mile from many of Las Vegas top attractions, our extended stay Las Vegas hotel offers a free shuttle for our guests. Our Las Vegas shuttle stops at Mandalay Bay, Aria, and Town Square Las Vegas from 7 AM to 1 AM and departure service to LAS. Whether you are here for business, conventions or leisure, our pet-friendly Las Vegas hotel off the strip is the ideal location for your stay. Amenities at our Las Vegas hotel include free WiFi, outdoor spaces with grills, Sports Court , outdoor pool & 24-hour fitness center. Enjoy a complimentary hot breakfast each morning and free appetizers and drinks at The Mix three nights a week. At day's end, our spacious Las Vegas hotel suites are set up for comfort and relaxation with full kitchens and separate sleeping and living areas. Our Las Vegas hotel off the strip is the perfect place for your stay.